The steps below walks you through creating a virtual hard disk that will contain your OneDrive folder. The virtual hard drive will be dynamic, which means your virtual hard disk will start out as a small file and grow and shrink as you add and remove files from your OneDrive folder. Step 2.1: Right-click on the Start Button and select Disk Management. Step 2.2: In the Disk Management window, click on the Action menu item and select Create VHD. Step 2.3: In the Create and Attach Virtual Hard Disk window, click Browse. 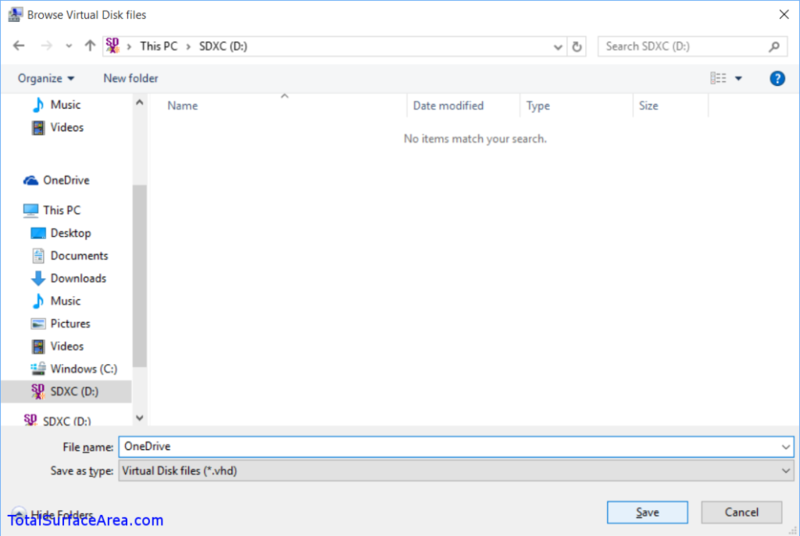 Step 2.4: In the Browse Virtual Disk files window, select your micro SD card or removable drive and type in a file name you want to use for the OneDrive virtual hard disk. In this example, my micro SD card was drive “D:” and I named my virtual hard disk “OneDrive.” Click Save. Step 2.5: In the Create and Attach Virtual Hard Disk window, enter the “Virtual hard disk size.” I entered the free space I noted in Step 1.7 (which for me was 118GB). You may want to enter your total OneDrive size if it is smaller than your removable drive. Make sure you select the right MB, GB, or TB for to the size. 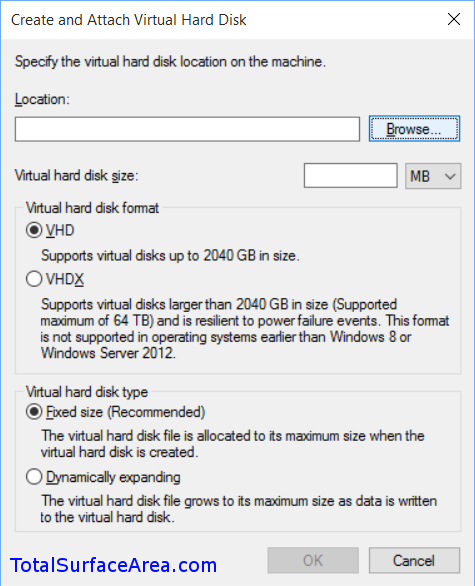 Select “VHDX” in the “Virtual hard disk format” section. 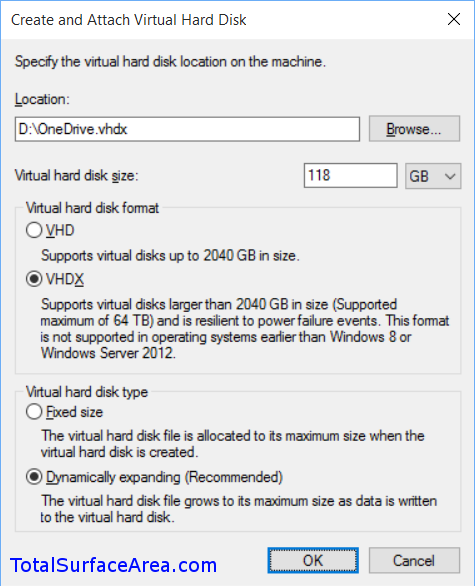 The “Virtual hard disk type” should change to “Dynamically expanding.” Click OK. Step 2.6: In the Disk Management window, you should see another disk at the bottom of the list. 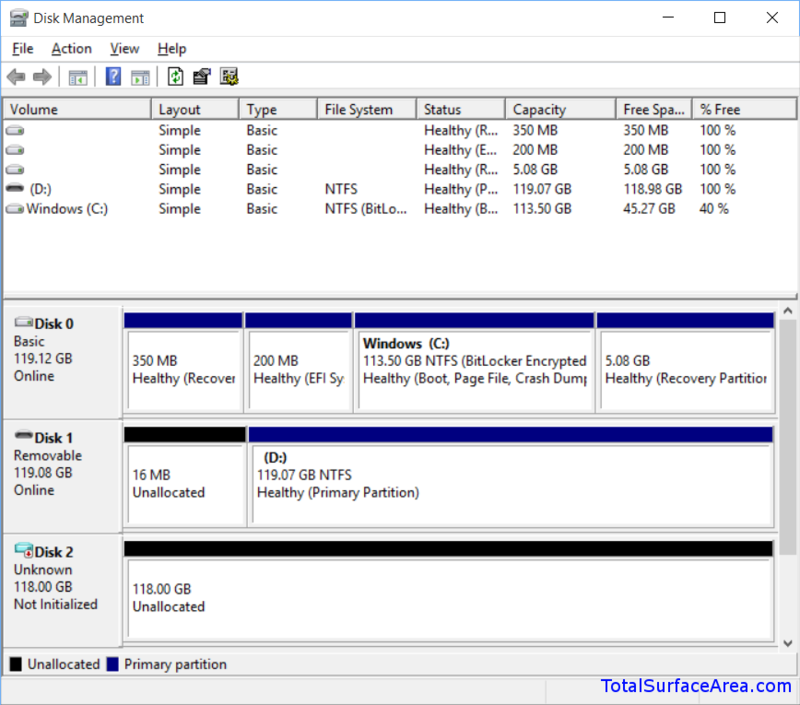 For my Surface Pro 3, Disk 0 is the primary SSD, Disk 1 is my removable micro SD card, and Disk 2 is the virtual hard disk that we’ve just created. Notice Disk 0 and Disk 1 are online and Disk 2 is not initialized. That’s the next step. Now click Close. Step 2.7: This step is not needed, but it is good to see what we’ve done. Open File Explorer and select your micro SD card or removable drive. See the vhdx file? This is the virtual hard disk file that will grow as you put more things in your OneDrive folder. 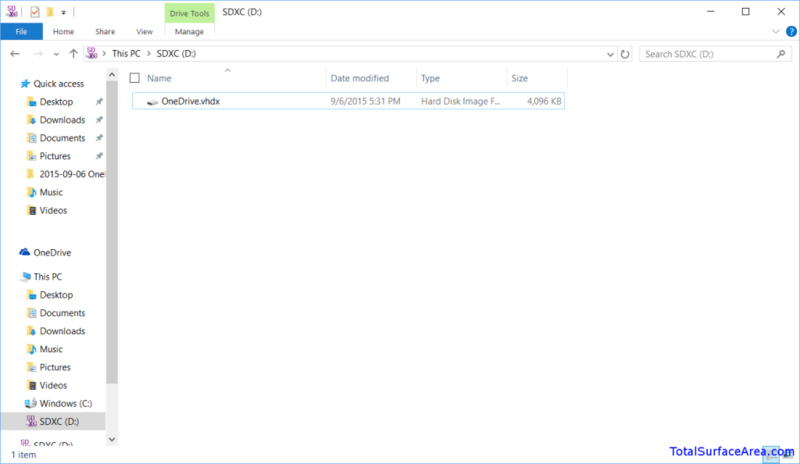 In my example here, it is OneDrive.vhdx. You can close the File Explorer window. Be sure to specify in step 2.2 that the hard drive needs to be selected to create VHD.